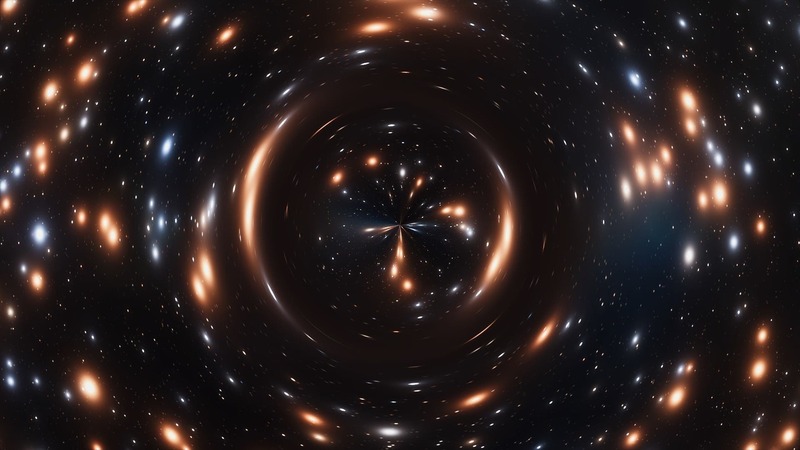 "Wormholes do not have an event horizon, but act as a space-time shortcut that can be traversed, a kind of very long throat that takes us to another universe," says Pablo Bueno from KU Leuven University (Belgium). "The confirmation of echoes in the LIGO or Virgo signals would be a practically irrefutable proof that astrophysical black holes don't exist. Time will tell if these echoes exist or not. If the result were positive, it would be one of the greatest discoveries in the history of physics." The scientific collaborations LIGO and Virgo have detected gravitational waves from the fusion of two black holes, inaugurating a new era in the study of the cosmos. But what if those ripples of space-time were not produced by black holes, but by other exotic objects? A team of European physicists suggest an alternative—wormholes that can be traversed to appear in another universe. 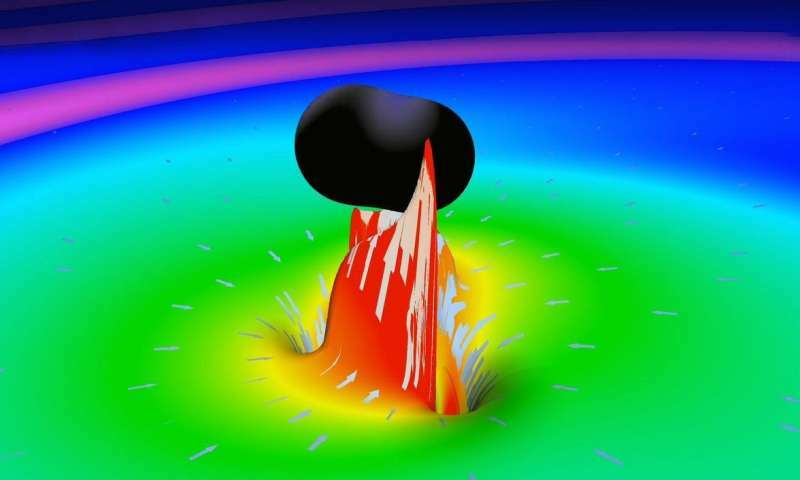 Scientists have deduced the existence of black holes from a multitude of experiments, theoretical models and indirect observations such as the recent LIGO detections, which are believed to originate from the collision of two of these dark gravitational monsters. But there is a problem with black holes—they present an edge, called an event horizon, from which nothing can escape. This is in conflict with quantum mechanics, whose postulates ensure that information is always preserved, not lost. One of the theoretical ways to deal with this conflict is to explore the possibility that the alleged black holes we 'observe' in nature are no such thing, but rather some type of exotic compact objects (ECOs), such as wormholes, which do not have an event horizon. "The final part of the gravitational signal detected by these two detectors – what is known as ringdown – corresponds to the last stage of the collision of two black holes, and has the property of completely extinguishing after a short period of time due to the presence of the event horizon," explain the Spanish researchers Pablo Bueno and Pablo A. Cano from KU Leuven University (Belgium). "However, if there were no horizon, those oscillations would not disappear completely; instead, after a certain time, they would produce a series of 'echoes,' similar to what happens with sound in a well. Interestingly, if instead of black holes, we had an ECO, the ringdown could be similar, so we need to determine the presence or absence of the echoes to distinguish the two types of objects." This possibility has been explored theoretically by several groups and tentative experimental analyses using the original LIGO data have been already performed, but the verdict is inconclusive. The team of the KU Leuven University, in which Professor Thomas Hertog also participated, has presented a model that predicts how gravitational waves caused by the collision of two rotating wormholes would be detected. The gravitational wave signals observed so far are completely extinguished after a few moments as a consequence of the presence of the event horizon. But if this did not exist, these oscillations would not disappear altogether; rather, after some time, there would be echoes in the signal, which may have gone unnoticed until now due to a lack of models or theoretical references with which to compare. According to the study, published by Physical Review D, the graphs obtained with the new model do not differ much from those recorded so far, except for the echoes, which act as a clear differentiating element.